More great live music in 2019! Stay tuned to this webpage for more information on dates & times. If you'e like to book us or get more information write to us at TheTwoOfUsProductions@gmail.com or use the mail sender tool at the bottom of this page. 2018 had some nice Summer Music under the stars! Friday July 20th 2018 - We had a great time with an enthusiastic crowd! It was a lovely and delightfully cool evening sunset on the Hudson River with the great music of The Copake Quintet. Boarding started at 6:30 and we shoved off at 7pm from the Hudson Public Dock. Visit HudsonCruises.com or call (888) 764-1844 for tickets. Saturday July 21st 2018 - We had a great time with a great crowd in historic Copake NY for a beautiful & breezy summer evening's live music concert with The Copake Quintet. The music started at 7pm at Copake Memorial Town Park. This event was free to the public courtesy of The Town Of Copake. 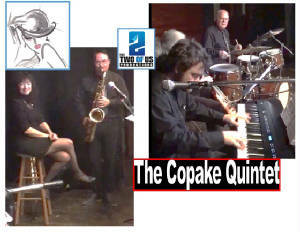 If you liked it please let the Copake Town Board know so that they'll continue their summer concert series and again host The Copake Quintet! Beautiful Friday night music cruises with Hudson Cruises: Come on out for a beautiful sunset cruise on the Hudson River along with great music by The Copake Quintet. We're performing on Hudson Cruise's "Spirit of Hudson", presenting from the Great American Songbook as well as some smooth & swinging.